During one-on-one LinkedIn consultations and also the Q&A time at my presentations, people are consistently interested in learning how they can get the right people to look at their profile. First, it's important to identify what the "right" people would look like—in other words, determine who you actually want to meet. If you're just not sure who the "right" people are, check out my article Is Your LinkedIn Network Made Up of the Right People? Sometimes people just need a little nudge—if you look at me, I'll look at you. So begin by using any of the LinkedIn people searching tools to search for the right people. The two I think shine above the rest are Advanced People Searching and University Pages/Alumni. Begin your search by entering the keywords you think the "right" people would include in their profile. Then browse through the profiles shown in the search results. When you see someone who looks interesting, click on the person's name to view their profile. That simple step alone may encourage some of these people to look at your profile. Once on the profile, there are a number of steps you can take. Some of these steps may not feel right to you at this point, but, trust me, they all increase the chances that this person will look at your profile. Review the person's Articles & Activity by clicking either See more articles or See all activity. "Like," share or comment on any of the articles or updates you think people in your network would find helpful. When sharing or commenting on someone's article or activity, consider using the @mention feature by typing "@" followed by the person's name. For example, if I'm commenting on Ryan Bilello's post, I'd type something like Great video @ryanbilello. When Ryan's name shows up in the drop-down choices, I'd click that entry. 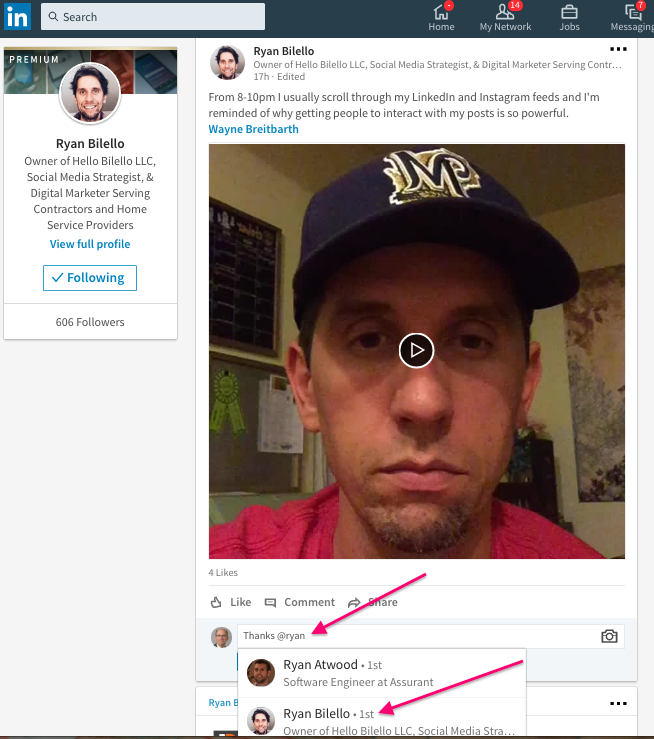 This triggers LinkedIn to send a notification to Ryan, telling him that he was mentioned in my update or share. The notification goes to the person's email Inbox in addition to their LinkedIn Notifications tab. If you are personally aware of the person's skills, you may want to endorse them for one or more of their skills. If the person doesn't connect with you right away, check your Who's Viewed Your Profile listing periodically to see if they view your profile sometime down the road. If you see that they've taken a look at your profile, consider reaching out to them with a new LinkedIn connection request, phone call, email, etc. If you routinely take these steps, your profile will consistently be viewed by the right people. And more profile views by the right people will generate more traditional interactions (phone calls, emails, meetings, etc.) with the right people. Of course, this will result in improved ROI for your time spent on LinkedIn. For more simple strategies to improve your LinkedIn ROI, along with a detailed critique of your profile, be sure to take advantage of my limited time offer: a one-hour, one-on-one phone consultation for just $175 (50% off my regular fee).